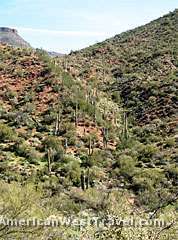 The conservation area offers over seven miles of trails for hiking, mountain biking and horseback riding. The trails are mainly along old jeep roads and are largely unimproved. 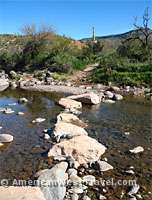 The Spur Cross and Metate Trails feature several crossings of Cave Creek where you might very well get wet during periods of high water. 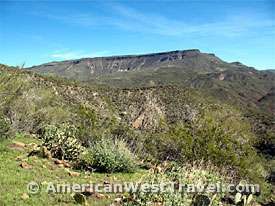 From the information board (where there are maps available) at the trailhead, go left (west) on the Spur Cross Trail. 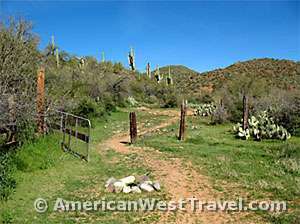 You quickly cross Cave Creek, then head right on the Metate Trail. 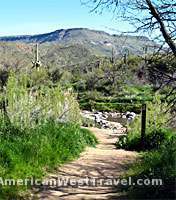 The scenic trail weaves through terraces and floodplains along Cave Creek with lush vegetation. There are several remnants of old ranch structures. 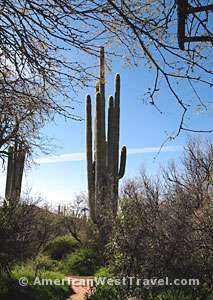 After crossing the creek again, you'll pass through a lush area with numerous huge, multi-armed saguaros (photo, left). While still on the creek's east side, you will see remnants of a corral on the other side. The Limestone Trail starts at the south end of this corral. 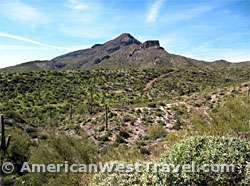 After crossing back to the west side of Cave Creek, you will immediately see a huge rock cairn. The entrance to the corral is behind and to the left of this cairn. The trail at the south end of the corral has a sign and is fairly obvious. Note that it turns right almost immediately and starts heading up the saddle. There the trail is very rocky and faint here but occasional rock cairns make the route obvious. 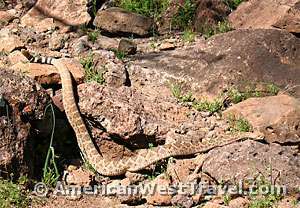 Before reaching Limestone Spring, we encounter a three-foot rattlesnake (photo, left) sprawled across the trail. The snakes often like to sun themselves on mild spring days such as this. The trail is free of shrubs making it a good spot for sunbathing. We do the right thing, which is to give the snake a width berth and leave it alone. Page Spring is about thirty minutes past Limestone Spring on a spur trail through dense vegetation. The main trail, marked with a cairn, turns right and climbs a short rise. There's another side trail going left; the main trail stays right. You soon reach a trail intersection with a large, decorated rock cairn (photo, left). Take the trail left for the shortest loop. Going straight will add at least 1.5 miles and a stretch of the tough Elephant Mountain trail. The trail south goes through a grassy area with nice wildflowers this year. Elephant Mountain (photo, right) is prominent to the west. At the intersection continue south (straight) on the Elephant Mountain Trail. At the Tortuga Trail intersection, turn left. This trail goes sharply down a hill on a very rocky, old jeep trail before reaching the Spur Cross Trail, where you head left on a better old road. 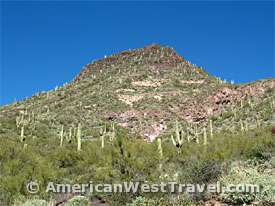 There is one more hill, up and down, before reaching Cave Creek and then the trailhead. Park information. 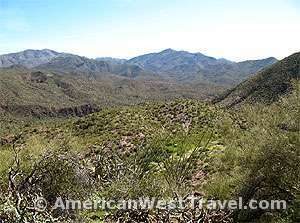 This fine loop provides a variety of environments and vistas in a very unspoiled desert setting. The best times to go would be fall through spring. With the higher elevations, summertime would be comfortable early in the morning. The park is open for day-use only, 6am to 8pm. The entry fee is $3 per person.